Is your senior family member already taking regular medications? This is a reality of our elderly loved ones. Their compliance with their medication schedule and intake dosage is called medication adherence. As the leading Home Health & Hospice in Wichita, Kansas, we put a high emphasis on our clients’ medication adherence because we believe that doing so can achieve great things for their overall health. However, we also understand that seniors may encounter challenges when it comes to medication adherence. These challenges can keep them from religiously following their intake and can spell complicated results to their health. Seniors can benefit greatly by using pill boxes, especially in terms of medication adherence. There are many available pill boxes today that are good for the day, week, or monthly intakes. These boxes contain compartments wherein the medications can be placed. When that compartment is empty, it means that the medicine has already been taken. This is their concrete evidence that they have not been missing out on their dosage. 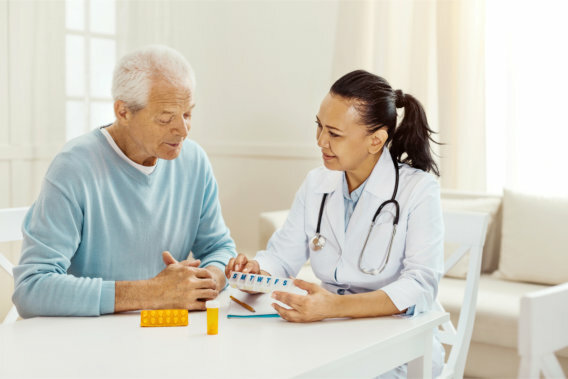 When your loved one has a home health aide with them, it’s going to be easier to adhere to medications, especially as they can assist your family member into their daily routines. The good thing about routines is that they become part of the person’s internal system, so they will have an automatic response to it. It will be very natural for them to take their medications right after breakfast, for instance, when this has been well integrated into their routine. Good thing with technology is that they can also assist the seniors in remembering their medication. There are now available talking alarm clocks that can remind your aging loved one that it’s time to take their medicines already. There are also iPhones which they can use to set alarmed reminders. The phones can also be used to call them and remind for medication intake. These are just among the easiest strategies to adhere to one’s medications. It’s important to remember that the opposite of medication adherence is risky for your loved one. The risks can even be costly as you could spend more for a new set of medications or hospital admissions or re-admissions. Simply put, adhering to your medications can secure the overall health of your aging loved one. Adhering to your medication is a vital component of providing health care in Kansas. Hence, our team of care providers is experienced and sensitive in ensuring that adherence is really practiced at home. Not only that, however, our team is also skilled in assisting other care needs of your loved one, both short-term and long-term, even when they’re on the road to life’s end. If you need our services at Providence Home Health and Hospice LLC, set an appointment with us for an assessment right away. This entry was posted in Home Health and tagged Healthcare, Medication Adherence, Medication Schedule. Bookmark the permalink.